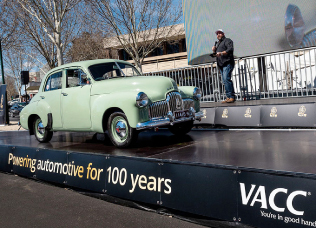 Last month marked 100 years of VACC and the occasion was commemorated with a three-day celebration, concluding on Saturday, 22 September with the VACC Centennial Cavalcade & Show ’n Shine and Gala Dinner. Having formed in Bendigo on 20 September 1918, the central Victorian city was naturally enough chosen as the site of the 100-year celebrations. By hosting events in its founding home, the association proudly embraced its rural roots, paid tribute to members past and present, long-term and new, and in addition thanked the wider community of the City of Greater Bendigo. On Thursday, 20 September the VACC Executive Board sat for a special board meeting at Bendigo Town Hall and a bronze memorial plaque was then installed on Cahill Chambers – formally known as the Bendigo Chamber of Commerce – on 20 September 1918. Friday, 21 September had more of a future-focus, rather than reflective, with a strategy day occupying the Executive Board. The activity was designed to reposition and refocus the Chamber for the challenges it could encounter during the next 100 years. Then the day 100 years in the making arrived, the VACC Centennial Cavalcade and Show ’n Shine held on Saturday, 22 September. 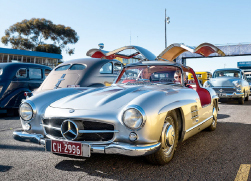 In the early hours of the morning at Calder Park in northern Melbourne, 100 different vehicles from 100 different years arrived to make history. 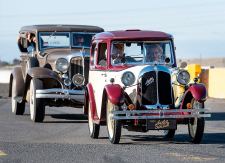 Waved off by event ambassador and participant, Shane Jacobson, the fleet of cars, commercials, trucks and motorcycles hit the road and headed toward the Bendigo Town Hall precinct, led by a 1918 Buick Roadster. Upon arrival, they were greeted by crowds and welcomed by Bendigo Mayor, Margaret O’Rourke, before being individually introduced by Shane Jacobson on the main stage. 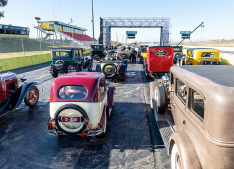 The day that followed was a truck-load of fun and full of automotive marvels, not to mention history. Later that evening VACC President, Tony Sanchez, welcomed ticket holders and special guests at the VACC Centennial Gala. Held at the Bendigo Town Hall, guests raised a glass to the century past and the next 100 years. Last month marked a collective milestone – for VACC and its members, the City of Greater Bendigo and the Victorian automotive industry. Without the passion and support of each of these driving forces, there would be no history to celebrate and VACC would not be what it is today.